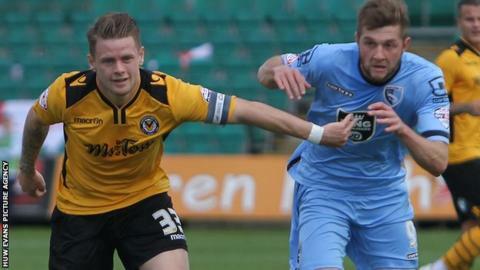 Newport County captain Mark Byrne wants his young team to show maturity after suffering their sixth defeat of the season. Paul Mullin's late penalty secured a 2-1 win for Morecambe and inflicted more misery on winless County. The Exiles remain bottom of League Two ahead of Saturday's trip to Dagenham & Redbridge, a game Byrne says is a must win. "The boys need to grow up into men," he said. "That's our problem - we're making mistakes week in, week out which is not good enough. "We've got to go there and get a win. We don't want to fall too far behind." Alan Goodall's header from a corner gave Morecambe the lead before Scott Barrow's first Newport goal brought his side level. But Mullin converted from the spot in the 94th minute after a foul on Kevin Ellison to leave Terry Butcher's side three points adrift of Byrne's former club Barnet at the bottom of League Two. "I would be concerned if we were playing badly every week," Byrne, 26, added. "We play well but we're not getting the results. We keep kicking ourselves in the teeth every time. "Hopefully when we get that first win we can go on a little run."